The effect of testosterone replacement therapy (TRT) on cardiovascular risk has been controversial [1, 2]. Concerns regarding the cardiovascular safety of TRT first surfaced in 2010 when Basaria et al. reported that in a population of older men with limitations in mobility and a high prevalence of chronic disease who were randomized to receive placebo gel or testosterone gel, that the application of a testosterone gel was associated with an increased risk of cardiovascular adverse events (23 subjects in the testosterone group, as compared with 5 in the placebo group, experienced cardiovascular-related adverse events) . Since this report, many retrospective studies regarding the safety of testosterone replacement therapy in hypogonadal men have been published with mixed results [4–8]. However, it is important to note that the designs and study populations in these reports differed significantly, which may explain the heterogeneity of the observed results. While there have been many prospective randomized controlled trials published recently regarding the benefits of testosterone replacement therapy on sexual function, mood and depression, bone mineral density, and anemia, the cardiovascular safety and the risk of mortality associated with TRT remains unclear [9–12]. A placebo controlled clinical trial recently reported an increase in coronary artery non-calcified plaque volume in men receiving TRT; however, the clinical implications of this observation have not been determined . Our study found that in men with secondary hypogonadism unrelated to overt pituitary disease, with a modest prevalence of CVD, no difference in the risk of the composite outcome in men exposed to TRT vs. those that were not. Our study excluded patients with primary hypogonadism and patients with overt hypothalamic/pituitary pathology because the risk profile of these patients may be different from that of the population of older patients included in our cohort, though many of the studies that have been recently published in the medical literature have included these types of patients [4–7]. A recent study published by Cheetham et al. in 2017 did exclude patients if they had testicular or prostate cancer, pituitary gland disorders, androgen insensitivity syndrome or Klinefelter syndrome, and unlike our report, found that among men with androgen deficiency, dispensed testosterone prescriptions were associated with a lower risk of cardiovascular outcomes over a median follow-up of 3.4 years . It is important to note, however, that the primary composite outcome in this report included more endpoints than did our report, the composite included acute myocardial infarction, coronary revascularization, unstable angina, stroke, transient ischemic attack, and sudden cardiac death. Otherwise, much of the available literature has included many types of hypogonadal patients, identified by low serum testosterone levels, a nonspecific coded diagnosis for androgen deficiency (ICD-9 codes 257.2, 257.8, and 257.9), and/or documentation of testosterone prescriptions, irrespective of the underlying pathophysiology driving the development of hypogonadism. Low serum testosterone levels have been associated with an increase in cardiovascular (CV) and/or mortality risk in many retrospective epidemiological studies and meta-analyses [16–20]. However, this does not mean that CV and/or mortality risk will necessarily be reduced by treating the low serum testosterone level with TRT. Perhaps the duration of the hypogonadal state, comorbidity burden, etiology of the low serum testosterone, and patient age at the time of initiation of TRT may be more significant drivers of CV/mortality risk than the TRT. Whether low serum testosterone levels are just an association with CV risk and/or mortality risk, or there exists an actual cause and effect relationship, has yet to be answered. Alternatively, low serum testosterone may simply be a marker of overall poor health, and replacing the testosterone may or may not translate into advantageous outcomes. Currently, the only clear indication to provide TRT supplementation to older males with low serum testosterone is largely to improve the symptoms of androgen deficiency, so long as the benefits are felt to outweigh the potential risks [21, 22]. 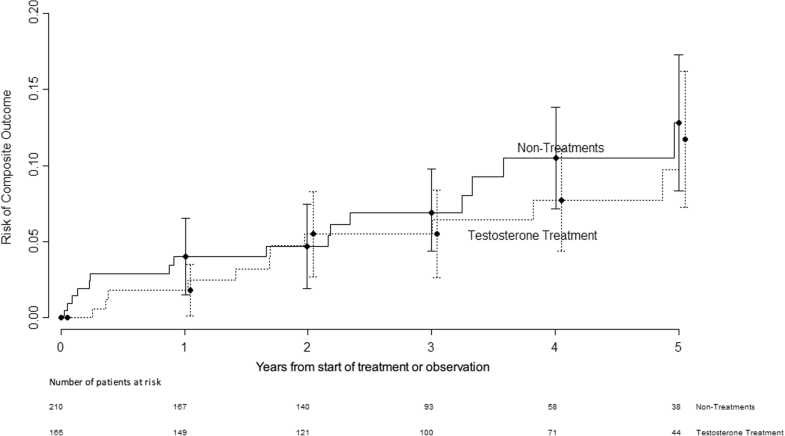 While we excluded patients that would be likely to have contraindications to testosterone treatment, it is certainly possible that TRT may have been avoided in patients perceived by clinicians to be sicker, for factors not included in our matching, and our analysis with matching still may not be properly recognizing these “sicker” patients. Certainly, there is an inherent selection bias that cannot be overcome with a retrospective data analysis, and it was not possible for us to determine why a patient with hypogonadism included in our report may or may not have received a prescription for TRT by their treating physician. Our patients represent a convenience sample of retrospective data and the possibility of selection bias remains.